Imagine for a moment watching Dawn Wells, the once and future Mary Ann from Gilligan’s Island, preparing an appetizer using reindeer pate. Good news—you don’t have to imagine it, because it actually happened. It aired as part of Chopped’s “Celebrity Holiday Bash” episode. Wells was one of four celebrities competing for charity, though she was eliminated after the entrée round. I was reminded of Wells, and all the other celebrities I’ve seen compete on cooking shows, because Chopped Star Power, another celebrity-based tournament, debuted on March 28. It’s the latest example of the weird fascination people have with watching celebrities cook food. Chopped is particularly fond of trotting out celebrities to try and spice things up and to perhaps grab a few extra set of eyeballs for the show. If you are not familiar with Chopped, the show revolves around four contestants competing in three rounds, each round built around a basket of four mystery ingredients that must be included in the dish. It’s pretty much the platonic ideal of cooking competition shows. However, while the show usually features professional chefs, on special occasions celebrities pop up. It should probably go without saying, considering that we’re talking about basic cable reality TV, that the level of celebrity is pretty mediocre. I mean, if Dancing with the Stars has to settle for the likes of Bindi Irwin, what is Chopped supposed to do? This isn’t about making facile remarks regarding the low quality of celebrity on these cooking competition shows, though. It’s about the very fact that celebrity cooking competitions shows even exist. Why, exactly, do people want to watch celebrities cook competitively? I do need to rewind for a second and go back to the whole “low level celebrity” thing, if only to say it’s not the names that are drawing people. In the ads leading up to Chopped Star Power the only two people I recognized were actress Ileana Douglas and comedian/actor Ron Funches. Is anybody excited about seeing Coolio or Lou Diamond Phillips? I don’t really care about seeing Wells, and I’m a weird person who loves old sitcoms. If I’m not excited to watch Mary Ann cook, I don’t know why anybody would be. There’s also the fact that, and this probably goes without saying, most of these celebrities aren’t very good cooks. Some of them are legitimately bad. Some are, admittedly, pretty decent, if not on the level of the actual chefs who appear on these sort of shows traditionally. Food Network made three seasons of a show called Rachael vs. Guy: Celebrity Cook-Off, which was a show built entirely around celebrities competing in cooking competitions. 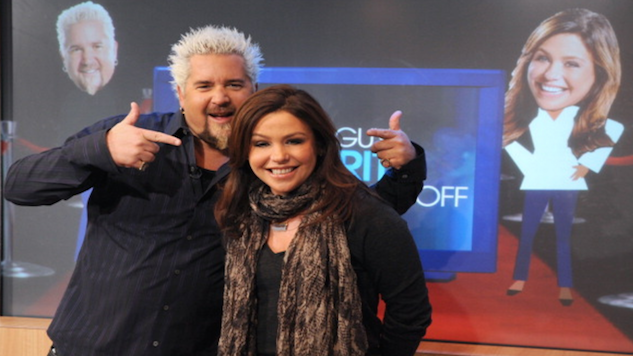 Also, yes, it was hosted by Rachael Ray and Guy Fieri, which is pretty much a nightmare to begin with. The best chefs of these celebrities, folks like the aforementioned Lou Diamond Phillips and Dean McDermott, tended to lap the field. Meanwhile, people like Aaron Carter and Gilbert Gottfried got obliterated. The “competition” part of these cooking competitions is often decidedly lacking. The one celebrity-based cooking competition show whose popularity makes sense on the surface is the one season of Worst Cooks in America that featured celebrities. The entire point of Worst Cooks in America is watching bad cooks get better, and celebrities who are bad at cooking are on the same cooking skill level as the general public. That part of the show remains the same, and then you get the added bonus of knowing who the people are. The winner of that season, for the record, was JWoww from Jersey Shore. So, to recap, Food Network alone has given up several episodes of Chopped featuring celebrities, an entire season of Worst Cooks in America, and an entire TV series dedicated to watching celebrities cooks. Clearly, there must be some sort of appeal, but what is it? Granted, the answer may be thunderingly obvious. It could just be a celebrity thing. I personally have never gotten all that excited about seeing celebrities. I’ve never watching Dancing with the Stars or that show where celebrities dived. Simply seeing a celebrity doesn’t appeal to me. In fact, sometimes I straight up skip the celebrity episodes of Chopped, because I watch the show to see talented people compete in an interesting format. Obviously, others feel differently. Otherwise, TMZ and gossip magazines wouldn’t exist, and stuff like Dancing with the Stars wouldn’t exist. On the flip side, some of the viewers could simply be dedicated to the format. They watch celebrity editions of Chopped because they think Chopped is really cool, and they don’t care who’s on it. After all, Celebrity Cook-Off only ran three seasons, while Chopped has run 31 (their seasons are weird). At this point you might want to just chalk it all up to Occam’s Razor. Celebrity cooking competitions exist, and arguably thrive, because some people like celebrities and some people like cooking competitions and there are enough of both to garner an audience. However, maybe there’s something specific about the combination of celebrity and cooking that appeals to people. There’s certainly the potential for rubbernecking. Chopped stresses out professional chefs who sometimes fail to get every mystery ingredient on the plate. Celebrities struggle even more, and it can take on a train wreck quality. There can be humor to that, and a morbid fascination, like watching a bad movie. Personally, I don’t find watching people cook badly interesting or amusing, even if they are a celebrity, but I will admit sometimes I am tickled by who appears on these shows. There is something about the realization “I am watching Sinbad make a dessert” that is delightful. It’s sublimely absurd. However, there could also be a slightly more noble reason for watching celebrities cook. It can be summed up in the old axiom, “Celebrities: they’re just like us.” Most people aren’t great cooks. They also like things that humanize celebrities, even if that celebrity is Peter Scolari. Watching a celebrity hustle in the Chopped kitchen or struggle to master the basics on Worst Cooks in America can make a celebrity feel more relatable, more likable, especially since they are always competing for charity. On the other hand, if they turn out to be an unexpectedly good chef, viewers can delight in finding out a celebrity has another skill. It’s the same principle that leads people to delight in watching a celebrity dominate over the NBA’s All-Star weekend. The first episode of Chopped: Star Power threw us a curveball because it was dedicated to “web stars.” This didn’t lead to appearances from the likes of Rhett and Link, Grumpy Cat, or other people I don’t know because I’m a 30-year-old man. Instead, the four chefs were all people with popular web cooking shows. That made this episode well within the normal parameters of an episode of Chopped. I thought I’d be spending this portion of this article regaling the readership with tales of actors who were tertiary characters on ‘90s sitcoms trying to make a dessert with quince paste, thereby delving deeper into the whole “What’s the appeal of watching celebrities cook?” question. Instead, I guess that will have to wait until next week’s episode. Hey, at least if you’re interested in watching celebrities compete in a cooking competition, you didn’t miss out. You’ll have four more opportunities in the upcoming weeks of Chopped: Star Power. Whatever your reason for watching is, be it the cult of celebrity or rubbernecking curiosity or simply an unbridled love for cooking competitions, Chopped: Star Power will be there for you. It almost assuredly won’t be your last chance either. It would seem people’s desire to watch people like Coolio trying to cook a duck breast is insatiable.